I love this 1936 film. It is 22 minutes long and well worth a watch. I love it for the black and white graphics, the period accents and the film’s radical suggestion that poverty is the main cause of malnutrition. The film is presented by Julian Huxley who was, at the time, Secretary of the Zoological Society, and it features a number of well-known personalities of the era. It draws heavily on scientific advances in the understanding of nutrition and several key people appear in the film including Professor Sir Gowland Hopkins who helped to discover vitamins, Sir John Boyd Orr, the Director of the Rowett Institute and Dr George M’ Gonigle, the Medical Officer of Health for Stockton-on-Tees. I particularly like the interviews with working class mothers about their shopping habits and how Dr M’Gonigle says, “…the average working class housewife, by rule of thumb methods, knows pretty well what food stuffs to buy to feed her family properly though she doesn’t know a vitamin from a bus ticket yet our investigations show quite clearly that as her income increases she approaches more and more nearly a really satisfactory diet….” [this is around 17 minutes]. In other words the poor diet of many people is not due to ignorance or stupidity but a lack of means. With the outbreak of World War Two in 1939 the British Government adopted many of the ideas set out in this film. Food rationing, which continued into the early 1950s, improved the diet of many people in Britain. 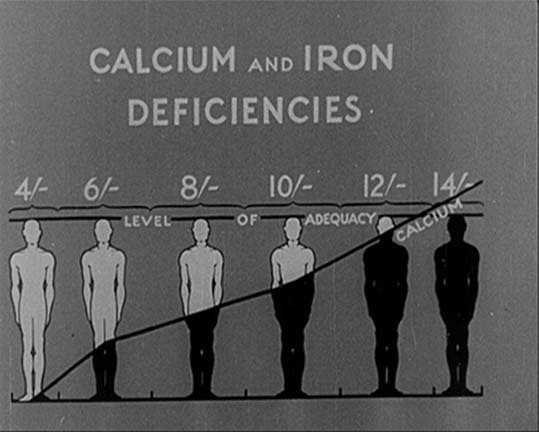 An image from the film which divides the population into six income groups and shows how poorer people are more likely to suffer from nutritional deficiencies. The film was directed by Edgar Anstey for the Gas, Light and Coke Company and is reproduced online with the permission of the National Grid Archive. If you want to delve deeper, the Wellcome Library holds lots of supporting information including a copy of John Boyd Orr’s report: Food, Health and Income : a report on a survey of adequacy of diet in relation to income, which was the inspiration for much of the film, and the archive of Dr M’Gonigle (PP/GMG). Sue Davies is External Projects Officer at the Wellcome Library.